I have posted a lot of queries for getting sales totals from the Sales Order Processing module. 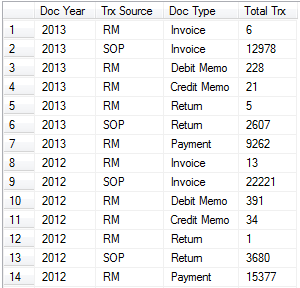 However, many companies also enter transactions directly in the RM (Receivables Management) module. In that case, if you need to see the data from both of these sources, you may need to take a slightly different approach to your reporting. To identify where your sales data is coming from, you can use this script. It will show you the total number for each type of transaction broken out by source and year. This is awesome – thanks for sharing!